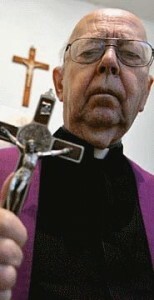 Father Gabriele Amorth is the leader of Rome’s six exorcists. He is also the most famous Catholic exorcist in the world. People come to see him from all round the world to ask for help in defeating satanic oppression, in other words, to combat the devil in all his various activities against mankind. Now 86 [born in 1925], he belongs to the Society of St. Paul, the Congregation founded by James Alberione in 1914. Known for his intense activity in mass communication. Fr. Gabriele too, for many years, was involved in media, and edited the magazine, Mother of God. As well as a theology degree, Fr. Gabriele has graduated in law. 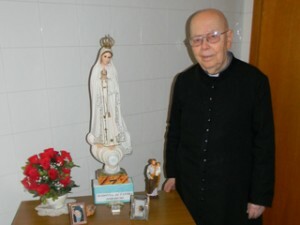 Having written many books and essays about the Virgin Mary, he has acquired the title of expert in Mariology, has been nominated as a member of the Pontifical International Marian Academy. But since having been entrusted with the role of exorcist in the diocese of Rome, his time has been completely consumed by his new ministry. These days he is considered the world’s leading expert on problems concerning Satan and his evil activity towards the human person. He is the “doctor” par excellence for illnesses caused by evil, the “surgeon” who knows how to root them out, fight, and prevent them. “How bitter, how bitter was the last message of Our Lady of Medjugorje on August 25: ‘Many have responded, but there is an enormous number of those who do not want to hear or accept my call,'” Fr. Gabriele Amorth first commented. “The Gospel is so clear. It tells us how to discern! By the fruits you will know the tree! It has been thirty years that Medjugorje has given us fruits that are ultimately exquisite! Confession, conversion, vocations, graces of every kind! For more than thirty years!” the exorcist reminded on Radio Maria. “In the Old Testament, God sent prophets to warn of the betrayals of the Jewish people. Now, here to warn of the betrayal of the Christian people, also the priests, God sends us His Mother! It has been thirty years! Is it possible that people still do not hear? And as for those people who believe themselves to be intelligent by saying they’ll wait until the Church approves? They are fools!” said Fr. Gabriel Amorth. Next post Medjugorje blessing online, November 17. Don’t miss it! Medjugorje messages of February 23, 21 & 20 say peace is threatened. Pray more for peace and in the family.